There are two types of 1970s nostalgia: the kind you remember if you were around at the time, and the kind everyone remembers – even people who weren’t born yet. 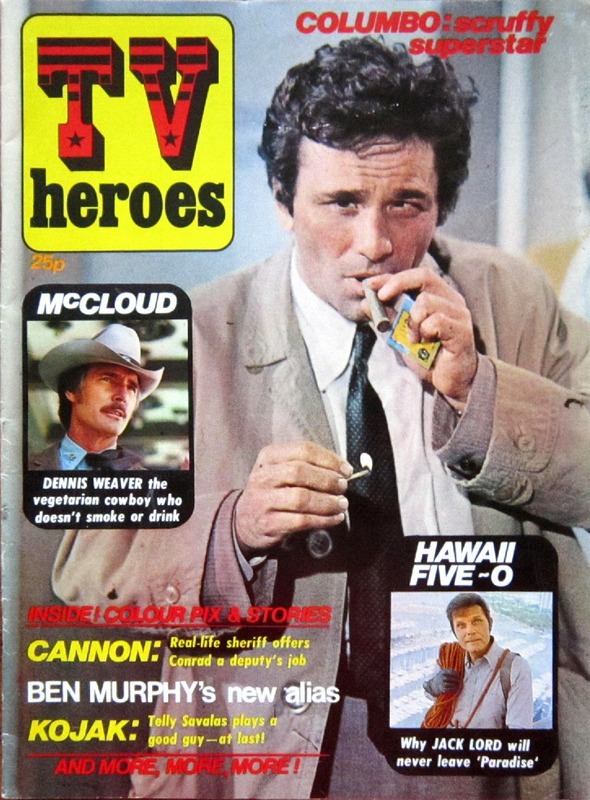 Most of the “TV heroes” featured in the one-shot magazine pictured above (undated, but I would guess 1974 or 1975) fall in the first category, but Columbo is a perfect example of the second. Originally just one of a rotating series of Mystery Movie titles (together with Banacek, The Snoop Sisters, Macmillan & Wife and several others), Columbo episodes continued to be reshown, year after year, long after the others were forgotten. Today in the UK, Columbo reruns can be seen regularly on both ITV and Channel 5. The original Mystery Movie series ran from 1971 to 1978, but Columbo was sufficiently popular that it was brought back for several more seasons starting in 1989 (the original series aired in the USA on the NBC network and in the UK on ITV; the revival was shown on ABC in America and on Sky in Britain). The first episode of the new series, “Columbo Goes to the Guillotine”, is described at IMDb as follows: “An egocentric psychic murders his old mentor, a magician charged to expose him as fraud, by beheading him while he’s rehearsing his guillotine trick.” That sounds interesting enough, and it’s pretty much how I remembered the episode from having seen it a quarter of a century ago (soon after I acquired a cable TV connection). But having watched a rerun on Channel 5 a few weeks ago, the episode is actually much less clichéd – and far more Fortean – than that brief synopsis suggests. The first thing that struck me as Fortean – or at any rate something that’s going to make more sense to someone interested in Forteana, rather than the clichéd expectations of a casual viewer – is that the “psychic” in the story works for a government-funded institute for psychic research, rather than performing his feats in front of a public audience. For me, this is a potentially much more interesting – and realistic – setting. What’s also realistic is that the institute’s director, Paula Hall, is pulled in two opposing directions. On the one hand, she wants to carry out a serious scientific investigation of extra-sensory perception, which (as in the real world) involves looking for small statistical glitches in long, laborious experiments. On the other hand, she needs to keep those government funds coming in – and that requires the kind of impressive, unambiguous results that can only be achieved by cheating. Her star psychic, Elliott Blake, may or may not have a genuine paranormal talent – but there’s no doubt he’s a highly skilled trickster. The two of them have worked out routines to fool the government observers, but even in private they keep up the pretence that Elliott really does have an underlying extrasensory talent – although it’s one that can’t be relied on to perform to order. In the case of Elliott, this attitude is probably out-and-out charlatanism; in the case of Paula it may be more along the lines of wishful thinking. I thought this was a clever touch, because it reflects a common phenomenon in the Fortean world – some people seem to think it’s OK to falsify evidence as long as it supports something they sincerely believe in (I could stray off the subject here and start talking about Bigfoot bodies and alien autopsy videos, but I won’t). A relevant quote from the IMDb article (spoken by Elliott Blake): “Our Mr. Harrow is not impressed by statistics. This man is in the market for miracles. I have the power to astonish him, you, and the entire world, Paula, but I am not a dancing dog in a carnival!” Mr Harrow is a shadowy government agent, interested in ESP because of its potential use in espionage: he wants “a demonstration that you can telepathically and precisely intercept the thoughts and actions of an enemy”. This again is a touch of realism; in 1989 the Cold War was still in full swing. Keeping a step ahead of the enemy – by whatever means possible – was the government’s Number One priority. The opening scene of the episode shows an experiment with Zener cards (circle, cross, wavy lines, square, star) of the kind that really were used in laboratory ESP experiments. When Columbo first sees them they are simply referred to as “ESP cards”, but later he uses the technical term “Zener card”. Perhaps the dumbing-down editor (I assume all TV shows have such a thing) crossed out “Zener” in one part of the script and missed it in another! Another clear Fortean reference is the “Randi” poster hanging on the wall of the victim’s workshop. The Amazing Randi, of course, is a professional magician who has a sideline in exposing fake psychics. The same description fits the aforementioned victim – Max Dyson, or “Max the Magnificent”. He has two jobs – one is debunking frauds on behalf of the government and other clients, and the other is making magic props such as the guillotine Elliott Blake uses to kill him. But contrary to what you might expect (and what I’d remembered from 25 years ago), Elliott doesn’t kill Max because he was on the point of exposing him as a trickster. The story is a lot cleverer than that... you really ought to check it out next time you see “Columbo Goes to the Guillotine” in the TV schedules. I remember seeing the episode, but can't recall how it was resolved so I'll be watching it again the next time it's on. Oh, meant to say - Marvel did a TV Heroes Summer Special back in the late '70s or early '80s, so if the one in your pic is by Marvel, it wasn't (strictly speaking) a one-off. The 70s show, McCloud, shown on that image at the top, had two Fortean episodes, one about vampires, one about werewolves, I remember as a kid the vamp one being campy, the wolf one a little more creepy. Thanks Brian. 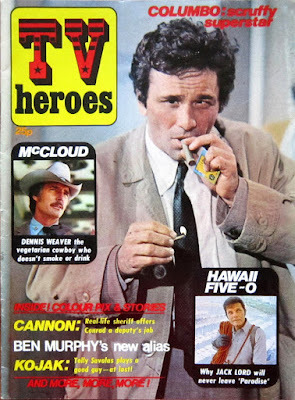 I watched a few episodes of McCloud in the 70s but I can't remember any of them - I probably would have remembered either of those if I'd seen them. I do remember an occult-themed episode of the Snoop Sisters, though - it had a guest appearance by Alice Cooper! I saw the Marvel "TV Heroes" summer special in your latest blog post this morning, Kid (was that coincidence or cause-and-effect?). I don't think mine is linked to Marvel in any way, though. It doesn't have a proper indicia - it just says (speaking from memory without digging it out again) "Published by IPC Magazines". Ah, they're not connected then. It just happened to be amongst a pile of comics I dug out of a cupboard for scanning, so it really is a bit of a (timely) coincidence- although I did have an idea it might be be in the pile. I saw the episode again this morning, and another coincidence came to the fore. I hadn't connected 'Max The Magnificent' with real life James Randi at first, but on seeing it again, the connection clicked. This morning, though, another coincidence clicked in .. before this, I had not seen the entire beginning of the episode, so I did not have a full view of the relationship between the murderer and victim. What leaped out at me was the line 'what we meant to each other, in that terrible place.' Not exactly what I would say to my best best buddy ... to a woman, but not to a man. 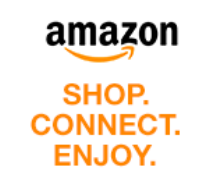 I could be stretching it a bit, but knowing that James Randi recently came out ... I wondered if the writer/producers knew that about him when they penned this story. Certainly it was a time when such relationships could only be hinted at on broadcast TV. A similar 'Untouchables' episode seemed to pair a couple of mobsters in a similar way.. Interesting idea - probably just a coincidence, but you never know!